I’m going to start by saying that motorcycle commuting is THE BEST. Nothing helps you get through a workday like starting it and ending it on two wheels. However, there are some downsides. For one – wardrobe. For two – hair. For three – commentary. Here are some quick tips for keeping those downsides to a minimum. This is what I do currently. I have a 15 minute, 5 mile commute. I keep a couple of pairs of dressier shoes in my desk for important meetings, but for the most part I wear clean boots in the office. They are totally office appropriate as long as they’re clean and fit with the outfit I’m wearing. I wear a leather or riding jacket over my shirt/sweater, and I just wear my office pants on the bike. I used to have a 20-mile, heavy traffic highway commute and I just didn’t feel safe without a lot of gear on. I kept shoes in my desk at work (noticing a trend?) and I wore some armored Dainese over-pants and an armored jacket on top of my work clothes. Sometimes that meant shoving a skirt into the pants, sometimes that meant sliding them over some trousers. 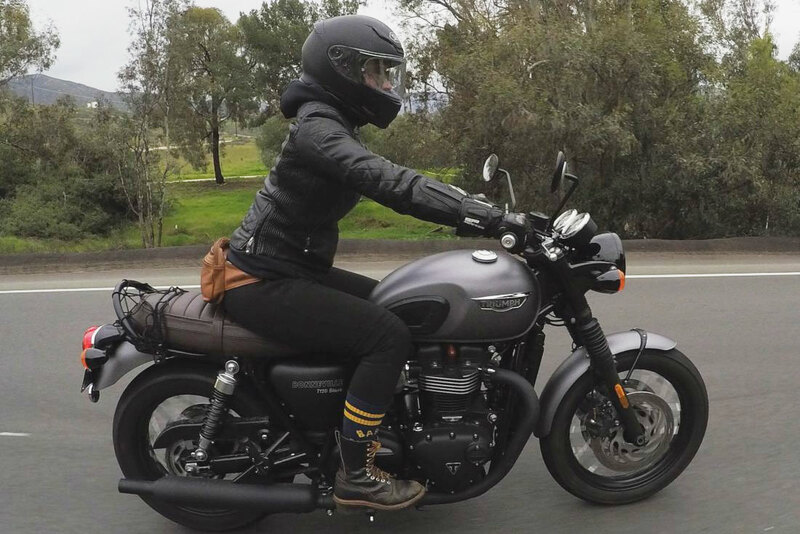 If you’re one of those lucky ducks without a formal office dress code, you don’t have to compromise comfort or safety as much as the rest of us when motorcycle commuting. It seems like every year more and more abrasion resistant jeans and casual-style clothing hits the market so the world is really your oyster. I have some bad news here. There isn’t really a solution. Keep your hair care products at work, cut your hair short, or do what I do and embrace a messy pony tail in the office. I also don’t wear makeup unless it’s a special occasion – so it’s possible my standards of personal appearance are lower than yours. Here are some things I get asked a lot and some answers that have worked well for me. Q: Don’t you get cold/wet/hot? Q: That looks so dangerous. Are you being safe? A: Never. I split lanes doing wheelies the whole way home. Q: Oh my goodness! You split lanes? A: That is literally the reason I started commuting by bike. So yes. Q: You don’t see a lot of girls on bikes. Q: I’m so scared for you! A: Why are you scared? Q: My brother’s uncle’s friend’s dad got in a really bad accident splitting lanes. A: I hope he recovered. Excuse me, I have to use the restroom. Commuting sounds great, but I’m a beginner rider, as in I have yet to try riding on my own. How would I work my way up to commuting? Where do I start? I’m guessing this would be an entire blog on its own. Thank you Katie and Sanna! Thank you for the pants link, I work in an office too, and I’m usually not ‘the best dressed’ and riding in hasn’t contributed to my business casual look. I just started commuting and I can agree that’s it’s the best! Having something other than work and crappy morning radio to focus on while I get there is irriplaceable. Of course! Some companies are making durable mens trousers, so hopefully they’ll start making some office appropriate women’s pants soon too.